CEO pay ratio disclosure is at hand. And with that, companies are finding many difficulties beyond identifying the median employee and calculating the ratio. Understanding what your pay ratio is—and conveying it to others, inside or outside your organization—provides a second, potentially more sensitive set of challenges to consider. Preparers. The ones who actually perform the analysis want to make sure the result is accurate, stable, and sensible. Management. Leadership often wants to stress-test the results based on assumptions and sensitivity. Further, management can be very interested in how their ratio compares to others along with the reasons for those differences. Some companies use this data to strategically analyze organizational pay structures and practices. Human resources. After disclosure, employees are likely to ask about the pay distribution, why certain employees are below the median, or why competitors’ employees might appear to earn more. Board of directors. Compensation committees are interested in the results, but may be more receptive to visuals and short summaries. Investors. Certain investors may have an interest in sustainable pay and fair global practices. Detailed analytics can reveal how a company’s pay practices are consistent with these goals. Media. Media representatives may look for examples of high ratios, unfair CEO compensation, and (in some cases) companies that overpay employees while passing the cost on to consumers. Whatever the concerns, data can tell the story. Here are three examples. A box-and-whisker plot shows the breakdown of the whole employee population. Each subgroup is paid relative to others. 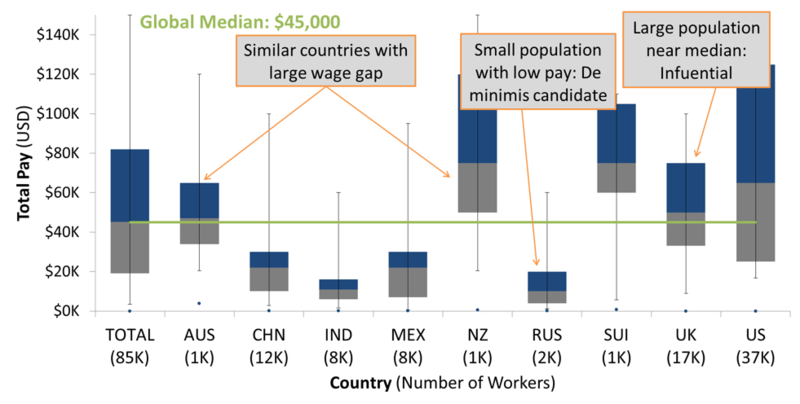 This helps to show where influential populations are, compare the wages of similar groups, and revisit international pay leveling. Populations can be broken out by meaningful categories such as geography, job type, or—for those looking to get a head start on the next wave of pay analysis—gender. Here, the boxes represent the middle 50% of each group, and the “whiskers” stretch from the 5th to 95th percentile. The gray meets the blue at the median for each group. A histogram can show the distribution of all of a company’s employees. This one includes clusters of employees as well as how much the median and ratio could move by adding or removing a given number of employees from the analysis. Also, this can help HR identify the range of employees who might be most concerned about pay at or below the median. This histogram identifies the number of employees in each $1,000 block of pay, and highlights the section containing the median and those within $5,000. A crosstab is a quick and useful way to identify the group of employees close to the median. This can help to find the most appropriate median based on factors such as wage and bonus stability, similarity of comparable employees (in case the median leaves or is promoted), and ability to determine whether any populations might have pay components not captured in the analysis. As companies work toward a comprehensive solution to their pay ratio disclosure, we continue to expect novel ways to convey the data to stakeholders. Taking the time to understand your company’s needs and ways to meet them can head off problems before they appear. Need help calculating your pay ratio or following up the calculation? Please reach out. We’d be happy to discuss your needs.